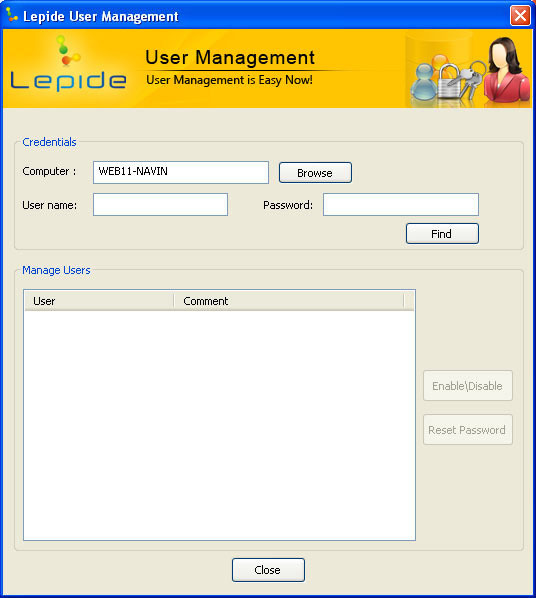 Lepide Local User Management is the most result oriented and convenient network management software that can help you organizing and managing the user account of every user present within a domain. In fact, this free local user management software is very much effective in fetching out the information about a particular user account in just a matter of few minutes. ...... locally. As an administrator, you can use the software remotely to enable, disable the accounts and reset their passwords. How to Use Lepide User Management? Launch Lepide User Management from the Desktop. Browse the Computer Name and type the logon credentials in the corresponding text fields. Type the new password in the Enter New Password and click OK. The password for the selected user will be reset provided the information given meets the password policy and complexity. Similarly, you can enable of disable a user account with Enable and Disable buttons. A freeware utility to manage local user accounts within Domain. Allows enabling and disabling account status. Saves quality time of administrator. Qweas is providing links to Free Lepide User Management 10.12.01 as a courtesy, and makes no representations regarding Free Lepide User Management or any other applications or any information related thereto. Any questions, complaints or claims regarding this application Free Lepide User Management 10.12.01 must be directed to the appropriate software vendor. You may click the publisher link of Free Lepide User Management on the top of this page to get more details about the vendor.